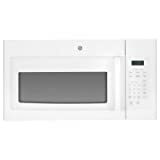 We have already reviewed a few General Electric over-the-range microwave ovens and it definitely seems like this company tends to spoil loyal customers with great kitchen appliances. They’ve released quite a few different models over the years and the JVM3160DFWWis another superb microwave that won’t burn a hole in your budget. Beauty is subjective, but the JVM3160DFWW definitely looks nice. This microwave is simple, elegant and stylish. Sadly, we don’t see many microwaves these days that are entirely white, but this one is and perhaps that is what makes it stand out so much. White conveys simplicity and elegance and that is what you can expect out of this model. The control scheme on the right, placed right below the pretty display, is easy to use and fits the overall design of the microwave very well. With the capacity of 1.6 cubic foot, this may not seem like the type of microwave to make cooking large meals easy, but somehow the JVM3160DFWW makes cooking effortless, despite the physical limitations. On the upside, this oven will fit in most kitchens and won’t take up too much space, due to its small size. The small size is not a sign of underwhelming performance. In fact, the JVM3160DFWW performs very well, but more about that in a bit. Overall, when it comes to design it’s difficult to find any flaws. The only thing that some users might not like is the door window, which is heavily covered with white dots. If you like checking on your food through the door window, this may be a problem, but this is certainly not a major flaw. Most powerful over-the-range microwaves make a lot of noise, but this is not the case with the JVM3160DFWW. The first thing you will probably notice about this microwave is that it is very quiet – almost completely silent. Dozens of built-in options and presets for cooking and reheating are available, such as Beverage, Potato, Reheat, Defrost: Weight/Time, Cook Time. No matter what kind of food you prepare, how large your meals are or how many people you have to cook for – the JVM3160DFWW does the job for you and makes the food taste great, cooking it evenly. It is also important to note that the turntable has an on/off feature, which can be incredibly useful sometimes. Sadly, for some reasons, a lot of newer microwaves don’t have that feature, but this one does and it works very well. On top of that, the turntable is very easy to clean and maintain, just like the entire unit. The venting system is one of the highlights of this model. The 2-speed exhaust fan automatically shuts on and off, further improving the overall user experience and the efficiency of the venting system itself. In general, this is a great microwave, but performance is indeed top notch and no matter what your needs or preferences are, the JVM3160DFWW delivers. Along with performance, the best thing about this microwave is the low price. This is probably the best model within the price range and one of the best over-the-range microwave ovens we’ve ever reviewed. The GE JVM3160DFWW is a one-size-fits-all type of microwave. Design, performance, venting – this microwave has everything you could ask for. It looks good, it’s easy to use, it performs extremely well and eases cooking more than the vast majority of microwaves on the market. It’s hard (and a bit unfair) to look for its flaws, because it doesn’t really seem to have any. The low price makes it a worthy investment and it’s an all-round bargain.